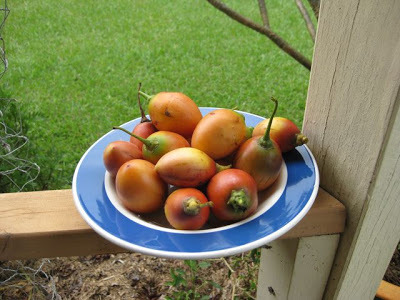 ABOUT: Tamarillo (Solanum betaceum) is a native to southern Brazil in the tomato Solanacea family and easy to grow in tropical and sub-tropical gardens. It is a fruit I was not familiar with until I came to Australia, but love it’s fresh clean taste and versatility in cooking. I have four plants in my suburban garden and they hardly take up any room at all, being an open and shrubby small tree that responds well to pruning after fruiting – so the fruit are easy to pick season to season – they will get to 4m if you let them. I have found that they are happy to be ignored (I just feed them a couple of times a year) as long as you don’t let them dry out or get completely waterlogged – mulch, mulch and more mulch. They need sun for at least part of the day, but will take some semi-shade. Because they are quite shallow rooted they are a fantastic plant to incorporate in a food hedge as they don’t over compete with the plants around them for water and nutrients – just remember the mulching. 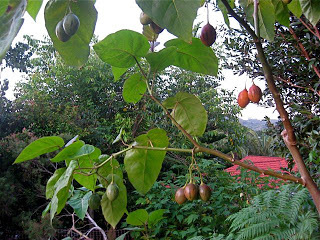 TAMARILLO and NUTRITION: The tree tomato is an excellent source of antioxidants because it contains a type of flavonoid known as anthocyanins. Furthermore, and more importantly it contains the carotenoids lycopene and beta carotene (vitamin A). Lycopene’s principle health benefit is to neutralize or inhibit oxygen derived free radicals. Free radicals are implicated in causing chronic diseases such as cardiovascular disease and cancer. Lycopene, along with the other carotenoids, beta-corotene, lutein and zeaxanthin, help protect and repair cells against DNA damage, thereby helping to prevent premature aging. However, of the four carotenoids, lycopene has by far the most antioxidant activity. The group of flavonoids called anthocyanins are found in red or purple plant color pigments, known as phytochemicals. These flavonoids are antimicrobial, anti-inflammatory and they help neutralize free radicals. They can also provide health benefits against diabetes, nuerological diseases, cancer and aging. Tamarillo is also a good source of vitamin C, as well as calcium, potassium, phosphorus, sodium and magnesium. Poached: I first had them this way at La Luciola Restaurant in Bali. 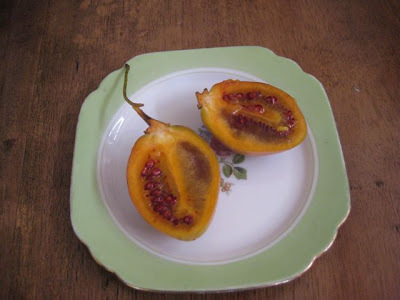 The pointy end of the fruit was scored with a cross so that when they were cooked it peeled back like a flower. They were poached with star anise and served with honeyed yoghurt. (It’s funny how I remember all of this but forget who I was with and when it was!) I have served them like this many times since then, often with a sweet baked ricotta. They are also good stewed with other fruits and berries – just scoop them out of their skin first. Jam: They make a fabulous jam – either by itself or with other fruit – that sets really well beacause they are so high in pectin. Chutneys: I have come across various recipes for this. As soon as all the crop is in (and we stop eating them!) I will try some and post up the recipe. NOTE: Click here for the link to a scrummy Tamarillo Yeast Cake recipe – an extremely versatile tea cake that I make all the time.